The Department of Transpiration claims it will put safer, cleaner, more fuel efficient vehicles on road. Go to http://www.cars.gov/ for CARS. U.S. Transportation Secretary Ray LaHood said his department stands ready to implement a new buyer incentive program signed into law last week by President Obama that will help consumers pay for new, more fuel efficient vehicles when they trade-in a less fuel efficient car or truck. 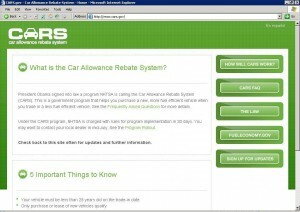 While the Car Allowance Rebate System (CARS) Act makes transactions on and after July 1 potentially eligible for credits under the CARS program, dealers and potential customers may want to wait until all of the detailed issues that must be addressed in the implementing regulations are resolved and the final rule is issued. Issuance will occur around July 23. Click here to sign up for e-mail updates. “At this important time for the industry, we will help to boost automobile and truck sales while putting vehicles on the road that are safer, pollute less and get more miles to the gallon,” said Secretary LaHood. Under CARS, buyers can receive up to $4,500 toward the purchase or lease of a new car or truck that meets the necessary criteria. To get a rebate, the new car must be priced at $45,000 or less, and, to receive the maximum rebate of $4,500, the new car must have a fuel economy rating of at least 10 miles-per-gallon greater than the car to be traded. To receive an incentive of $3,500, the same car would be traded for one that gets at least four miles-per-gallon better gas mileage. For passenger automobiles, the car to be traded must be drivable, have a fuel economy rating of 18 miles-per-gallon or less, and be registered and insured for the full year prior to the trade in. For most vans, SUVs and pickups, the vehicle to be traded must have a fuel economy of 18 miles-per-gallon or less. To receive an incentive of $3,500, the new vehicle must get at least two miles-per-gallon better mileage. To receive the $4,500 incentive, the same vehicle would need to be traded for one getting at least five miles-per-gallon better mileage. The purchaser does not receive the money directly from DOT. Instead, the dealer reduces the purchase or lease price by the allowed amount, and the government reimburses the dealer for that amount. The incentive program begins within 30 days of the bill signing by the President on 24 June. The final day for an eligible purchase or lease is November 1, 2009, or when DOT exhausts the funds set aside for the program, whichever occurs first. The credit is not retroactive prior to the start of the program and cannot be applied toward the purchase of used vehicles. To achieve the objective of removing older, less efficient vehicles from the roads, vehicles traded under this program will have to be permanently disabled and/or scrapped. CARS will be implemented by the U.S. Department of Transportation’s National Highway Traffic Safety Administration (NHTSA). 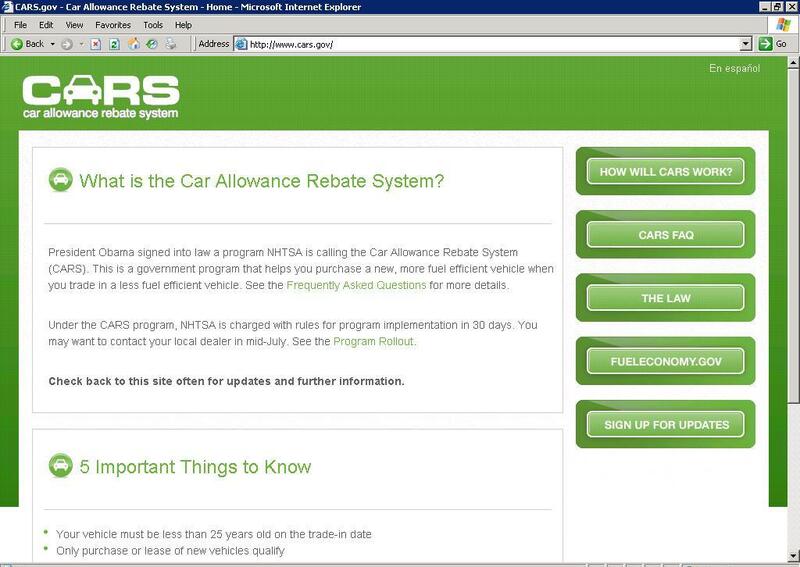 Consumers who want to learn more about CARS or the gasoline mileage attained by individual vehicles can go to http://www.cars.gov/ or call the NHTSA Auto Hotline at 1-888-327-4236. This entry was posted on Monday, June 29th, 2009 at and is filed under Automobiles. You can follow any responses to this entry through the RSS 2.0 feed. Both comments and pings are currently closed. Is crushing the clunker a requirement or can it be dismantled for parts? We will have to wait for the final rules. Environmentalists during the debate strongly objected to allowing engines and transmissions to be recycled since it would keep polluting vehicles on the road longer. You can guess which side the recycling and independent auto repair businesses were on. I’m betting scrappage will be required. How this will be enforced at a local level is going to be difficult. If my registration expires July 1, 2009, will I HAVE TO PAY TO HAVE IT RENEWED, JUST TO HAVE IT CRUSHED? The car is driven every day, is and has been continuously insured for over a year, and registered to me for over a year.